Flexi-Rail brings versatility to the aluminium chain screen. It can be used to produce a wave curved screen suspended from the ceiling, or face fixed onto a curved wall . The rail is made from brushed stainless steel and is available in 1.5m lengths in standard (78 holes per metre) and close knit (100 holes per metre). The lengths can be joined together to create any width of screen. We provide brackets for ceiling fixing (4 pairs per 1.5m length). When fixing to a ceiling, it is imperative that the brackets are screwed to a solid support such as joists or a bulkhead. Flexi-rail can be fixed directly to a wall using spacers provided to allow the chain strands to hang freely. 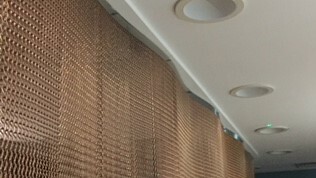 As Flexi-rail is designed to bend, screens instalation can be difficult if the chain is already attached. The easiest method is to fix the rail in place first and then hang the chain. We can provide the strands cut to the required length. To calculate the amount of chain needed multiply the width of the screen in metres by 78 for standard knit and 100 for close knit (the number of strands per metre width) and then multiply by the height in metres. E.g. a screen 4.2 metres wide x 2.6 metres high in standard knit would need 4.2m x 78 x 2.6 = 852 metres. If you prefer please email enquiries@vipscreens.co.uk or telephone 01845 525900 and we will provide advice and prepare a quote for your project.